The projection — a 2.57 ERA and 185 innings pitched — certainly seems optimistic at first glance. The of-late struggling Daisuke Matsuzaka, bless his little heart, has forever impressed his own career into the expectations of NPB players on many baseball fans, new and old schools alike. So Cartwright’s assumes his difficult task — as he must — with great precision. He is not content to just “blindly follow his off-the-wall forecast” as Tom Tango put it. Looking at each of the Japanese pitchers to skip the creek, Cartwright finds good reason to think — even with a dulled strikeout rate and a bumped walked rate — Darvish can still be a Top 15 pitcher in 2012. And I think he is correct. First of all, though it has been said and said and said again, Darvish is not Daisuke. Yes, both are Japanese pitchers coming over after enormous posting fees. Yes, both have been overworked by American standards. Yes, they were both elite in the Nippon Professional Baseball (NPB) league. A note of thanks to Patrick Newman for lateralling these stats to me in what is being called the greatest statistical flee-flicker of the young century. That’s a FIP-minus of 47. Forty-f’ing-seven. By comparison, Roy Halladay’s league leading 2.20 FIP in 2011 was a trifling 56 FIP-minus. The only one close to Darvish is Tanaka Masahiro (or Masahiro Tanaka, if’n you prefer given name, surname) with a Halladayesque 56, and then comes Tsuyoshi Wada (now a member of the Baltimore Orioles) with a 74 FIP-minus. Great? Yes. Darvish? No. Wada? Almost, actually. I kept the same y-axis scale in both graphics to help preserve the sense of proportion. Note how Darvish’s FIP-minus nearly touches the F3 button on your keyboard, while Daisuke’s 68 reaches like the toes of frightened 8-year-old hanging on to the monkey bars, trying to get down without dropping. 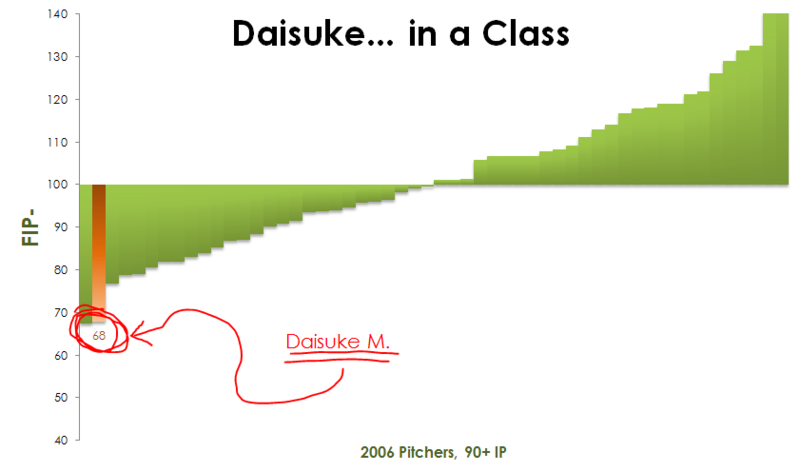 At the same time, we must admit that Daisuke has not been terrible at the MLB level. The 2011 season was heartbreaking for non-Rays fans (not such as myself), but overall he has 10.6 WAR in 5 seasons, with a career FIP-minus of 95. Is he what the Red Sox paid for? HAHAHAHA! No. But he still may be an above-average pitcher — if he can get healthy again. Examining several sets of comparable pitchers shows an expected ERA for Darvish anywhere from 2.78 to 3.40, which is from excellent down to merely very good, but no recent major league pitchers have the combination of Darvish’s expected home runs, walks and strikeouts. Looking at those comparables and Darvish’s pitch metrics give me a personal opinion: I would compare him to Felix Hernandez with more strikeouts or Ubaldo Jimenez with fewer walks. But if we consider that Daisuke’s FIP-minus went up ~30 points in the majors, we can make a dirty, nasty calculation of our own, adding 30 points of FIP-minus to Darvish. At a 77 FIP-minus, would have tied Doug Fister, Jake Peavy, and Matt Cain on the leaderboards. That’s still a sub-3.00 ERA. What about Felix Hernandez? He has an 82 FIP-minus on his career, or 35 points of FIP-minus higher. Ubaldo Jimenez? A career 80 FIP-minus, or 33 points higher. 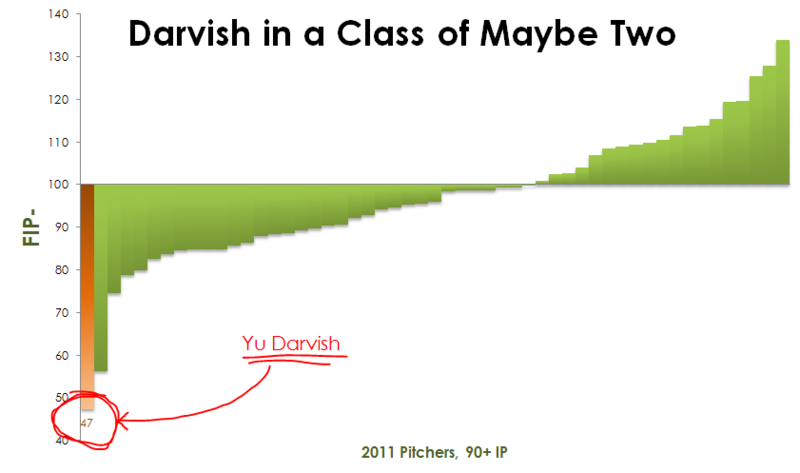 So even if Darvish crumbles as far as Daisuke did and then some, he’d still be a Top 15 or Top 20 pitcher in the league. And I think that pretty much makes me ♥ Yu too. We hoped you liked reading Yu Darvish 2012 Projections: He Go’n Be Good by Bradley Woodrum! Bryce Harper, Opening Day Starter?